The men in black once again stole the show in a Fleetwood Town game for the wrong reasons as Joey Barton's 10-men held on to draw 1-1 with Rochdale. On a day that should have been about two fine headers from Town's now 16-goal forward Paddy Madden and Dale talisman Ian Henderson it was Geoff Eltringham and his linesman at the centre of controversy. Fleetwood Town are bottom of the Fair Play table but the referee's decision to send Lewie Coyle off in the 54th minute was the game-changing moment. Town's second half curse rumbled on. They have now dropped 21 points from winning positions at the break though the straight red for Coyle after he appeared to win the ball in a challenge with Jospeh Rafferty did not help their cause. 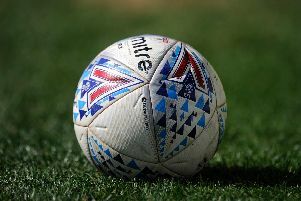 The referee allegedly gave the decision due to a call from his assistant who claimed that Coyle had gone over the ball. That claim, wrong and Town put in a position that saw them lose two points. It was a tepid start at the Spotland Stadium as both teams struggled to light up the pitch on a grey Greater Manchester day. Holden and Hamilton saw speculative efforts dealt with easily by Town keeper Alex Cairns who tested out his new purple gloves. Jason Holt was the man who attempted to make his mark on the game for Town. The Rangers loanee pouncing on a Madden knock down but he saw his curling effort deflected past the post. Barton had the rare luxury of naming an unchanged side for the game as he stuck with his 4-3-3 formation. Ian Henderson was the hero the last time the two side's met in the League. His late effort clinching a point in the 2-2 draw at Highbury. But he fired wide after Ash Eastham had made a huge block to thwart Calvin Andrew. But Town were left kicking themselves moments later. Ashley Nadesan arrived at Fleetwood Town in the summer of 2016 but he only made his league bow for the club in the 2-2 draw with Oxford last week. He shone in that 77 minute spell and once again continued to show he can cut it at this level, teeing-up Burns in the 20th minute. Nadesan had raced in on the right of the box and could have taken the shot himself from a tight angle but he unselfishly squared to the unmarked Burns. But the Welshman skied the ball over. A chance on reflection that was harder to miss that score. Though that flash of pace and ingenuity by Nadesan sparked another talking point. Why has it taken this long for the 24-year-old to get a proper shot at Fleetwood Town? The rough diamond might still need some polishing up but he was bright again on the right of a front three. The Rochdale players were left fuming with referee Geoff Eltringham when their shouts for a penalty were waved away. The Dale men claimed Craig Morgan had handled Ian Henderson's effort in the box before Alex Cairns collected but the man in black did not want to know. He did not endear himself to the home faithful in the first half but it was the 205 travelling support that would be left seething in the second half. Lewie Coyle had impressed on the right flank and nearly opened his Town account in exquisite fashion as the half rolled on. He picked up the second ball from a corner outside the box and whipped the ball up towards the top right corner. Joshua Lillis was left flapping at thin air but the ball just crashed into the post. But Town would take the lead from that right flank moments later. I'd questioned Ross Wallace's impact on the game in the press box but the midfielder showed his Championship class to shut me up in the 36th minute. It was his peach of cross from the right that out-foxed Dale with Madden nodding home his 16th of the term. Town would be second in the league if their games had ended at half-time. And it was again two of the regular themes of the season that reared their heads in the second 45 as they found themselves down to 10-men in the opening stages of the second half. Dale had started the half strongly and had the momentum. But though Fleetwood Town are bottom of the League One disciplinary table the quality of referees in this division must once again be questioned. Town had already suffered at the hands of questionable decisions by Brett Huxtable in the 2-1 defeat at Bristol Rovers as he unjustly sent Ched Evans off for violent conduct. That card was rescinded but the Town forward watched from the stands as he served the second of his two match ban for using foul language towards the official after the game. Barton himself was sent off at Rovers but was back in the dug-out after his two match touchline ban to witness yet another dubious decision. Full-back Coyle slid in on Joseph Raffery deep in Town's half and looked to have won the ball. The Dale man writhed around on the floor as Eltringham mulled over a decision. Eventually the man in black brandished a straight red card with Coyle trudging off shaking his head. Fleetwood Town Dirty? Or just plain victims of the reputation of their head coach Joey Barton? I think the majority of the Cod Army would argue the latter as the referee once again took centre stage. We await more acerbic words from Barton as the second half curse struck soon after. Town were valiant in their defending. Youngsters Harrison Biggins and Nathan Sheron sent on and impressing with their steel as skipper Craig Morgan and Ash Eastham put their bodies on the line to fight what they felt was the injustice of that red. Rochdale had the momentum before the red and the pendulum swung further in their direction after. But you can tell why they are battling at the wrong end of the division due to the lack of quality in the final third. Attack after attack, chance after chance they failed to get that elusive leveller. That was until captain Henderson stepped up to the plate. The chances had not fallen into his path but when that chance came he gobbled it up, nodding the ball over Cairns in the 76th minute. He was denied a match winner by the fingertips of Cairns. The Town shot-stopper had a comfortable afternoon despite the Dale chances with the majority of efforts straight at him. But the keeper showed his class as he just tipped the ball round the post after the attacker had out-muscled Sheron. Rochdale looked for a winner but Town fought gallantly to grab a deserved point on another day of questionable refereeing in the third tier. Fleetwood: Cairns, Coyle, Eastham, Morgan, Husband, R Wallace, J Wallace, Holt, Nadesan, Madden, Burns. Subs: P Jones, McAleny, Hunter, Bigggins, Sheron, Hill, Rydel. Rochdale: Lillis, Rafferty, McNulty, Ebanks-Landell, Dooley, Andrew, Camps, Done ( Matheson, 46) , Holden, Hamilton, Henderson. Subs: Delaney, Williams, Wilbraham, Inman, Norman, Adshead.